I had the opportunity to see Mission: Impossible - Rogue Nation a few days ago and I did find it to be mildly entertaining, yet somewhat unbelievable. My husband had previously seen the movie and loved it. He thought I would enjoy the movie as well. He knows that I appreciate movies that have leading women who are treated as intellectual beings and not sexual objects. The relationship between the two main characters, Tom Cruise and Rebecca Ferguson, maintained the professionalism of respect and admiration of two co-workers who rely on each other to accomplish a "mission". That particular aspect of this movie was definitely appreciated by this reviewer. It is to be expected with any of the Mission Impossible movies that the characters would have "impossible" physical abilities. However, this particular movie exceeded my ability to suspend reality enough to avoid being distracted by the inconceivable. Mission: Impossible - Rogue Nation [Blu-ray]If you can ignore the plot and over the top action scenes, you will find that there are a some redeeming qualities, namely a few of the actors who you just can't help but like. Simon Pegg, who played Benji, was by far my favorite actor in this movie. As the loyal friend and agent partner to Ethan Hunt (Tom Cruise), his character was more realistic. He is intelligent, but not perfect. He provided what light fun and entertainment I derived from the movie. He actually made me laugh a few times. Jeremy Renner and Alec Baldwin both played believable characters who each faced moments of personal decision and crisis with loyalty, strength and character. The two main characters in Mission: Impossible – Rogue Nation were actually simply stated, impossible. They both had superhuman physical abilities that reminded me of a combination of Spiderman and Superman, both fictional cartoon characters who we love, but we also know they are not even remotely "real". 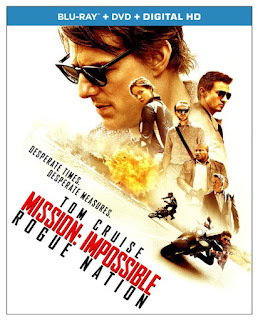 Mission: Impossible – Rogue Nation is categorized as an action thriller, but personally I would have to say I found it to be more of a fantasy filled with wishful thinking. Cynthia, your review made me laugh out loud. This was the movie my husband and I recently saw on our date night. I came away pretty much thinking as you did and your comment that this movie should be characterized as "a fantasy filled with wishful thinking" is dead on. The biggest negative I had was the lack of story development at the beginning...but my husband says that is how Mission Impossible is. I loved the London scenes since I had walked those very paths this spring and I loved some of the humor though I may have been the only one laughing out loud in the theatre. You and I might be surprised that Matt Zoller Seitz on Roger Ebert's website gave Mission Impossible: Rogue Nation a whopping four stars. You should read his review, I think you will find it interesting. His point that Tom Cruise is Tom Cruise (and not Ethan Hunt) sure seems accurate and that it is "a glorious film, which knows exactly what it wants to be and makes damn sure that Tom Cruise never stops running” telling. I agree with you Elf! Alec Baldwin is a stronger draw than Tom Cruise for me too. You would definitely like him in this movie (AB that is). I think it is a movie most people would enjoy, especially Mission Impossible fans. I always liked the tv series when we were kids. I found the move pure escapism and I enjoyed it. I like both Tom Cruise and Alec Baldwin and enjoyed them in this movie. I like action, adventure type movies but lately the language in most is so rough that it takes away from my enjoyment. That was not the case in this movie and I appreciated it. That is an excellent point Mary Beth!!! You know, thinking about it, I don't think I remember any bad or offensive language in the movie. That is definitely a huge plus! Excellent timing for this review. I watched the movie trailer earlier today and wondered if I would enjoy MI: Rogue Nation. Like you, I really enjoyed Mission Impossible as a child. Based on what you shared, I probably won't see this film. I was feeling a little iffy about it after seeing the trailer.